People don't cry out when they fall. I started off thinking what a bunch of arrogant, privileged men, thinking the world belongs to them and dismissing the local people. Good riddance to them when something horrible happens! It is written in the manner of a 1930s account and the attitudes are sadly very of the time. There's a bit of a tendency to apply modern values to historical fiction to make it more palatable but all that's doing is pretending things never happened. So yes, they are racist and completely disrespectful of local culture, and this may mean it's not for you. But our narrator does start to see the Sherpas as people, at least more than his companions. There's a lot of detail about their climb, it would be a fantastic book for someone who loves mountaineering and a lot of the less supernatural elements are taken from real expeditions of the time. I can imagine how easy it is for the brain to play tricks on you from the remote surroundings and harsh weather to the effects of altitude sickness. Just like in Dark Matter, it's an excellent subject to base a ghost story on; it would be easy to argue the men are driven mad by their situation. I suppose it's only to be expected that I'm out of sorts. The remoteness of this place... It forces one to confront one's own insignificance as never before. And we are so very far from help. The horror aspect of it is subtle, but insidious. I don’t think a rucksack has ever been so sinister! It’s a slow build but a lot more effective than trying to do too much. Not one to read more a climb or camping trip. The brothers have worshipped Lyell since childhood, with his memoir describing his seemingly selfless act of bringing the bodies of the fallen down the mountain. Yet Stephen’s hero was far from perfect and whilst Kits might not want to think otherwise, Stephen’s devotion starts to wane as he gets closer to the truth. There is a lot of sibling rivalry between them, Kits always trying to belittle his younger brother. 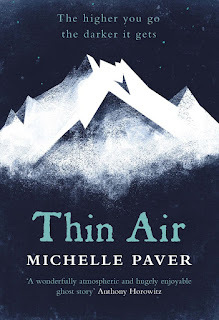 Thin Air is published by Orion and is available now in hardback and ebook editions. Thanks go to the publisher for providing a copy for review via NetGalley. I just finished reading Dark Matter during the week. The first book by Paver that I've read, but it won't be the last, I really enjoyed it. Thought it was a great slow build. So hopefully I'll get around to this one soon. Very much interested in this one, for all the reasons you point out. I hope it comes to USA soon.